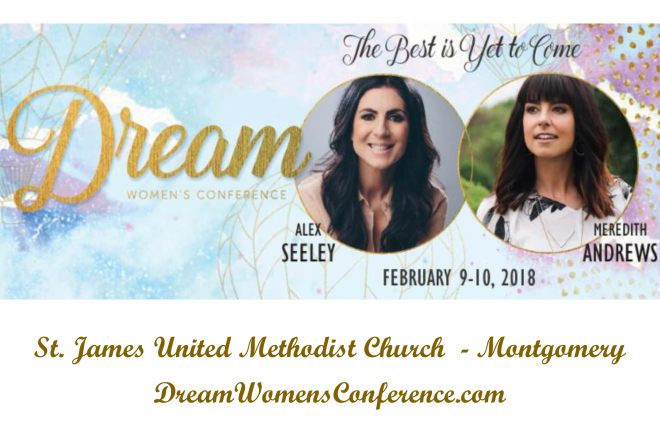 St. James United Methodist Church in Montgomery will be having its 2018 Dream Conference on Friday through Saturday, February 9 through February 10, with featured guests Alex Seeley and Meredith Andrews. Friday's session begins at 7:00 p.m. and Saturday's session begins at 9:00 a.m. Tickets may purchased in advance online. For questions or discounted registration for groups of 10 or more, email Please be sure to print your tickets after receiving your confirmation email. Ticket required for entry. All tickets will be scanned upon entry to the conference.